I’ve just been engaging in one of those post-New-Year’s projects: sorting through holiday photos. It’s put me in the mood to tell you about our five days in New Zealand, as those November memories still sit very pleasantly with me. You might remember my recent post about our week in the Cook Islands—well, after that adventure, Rick and I and our four travelling companions headed off from Rarotonga for the four hour flight to Auckland. Speaking of the flight, let’s start with the issue of airport safety and security. 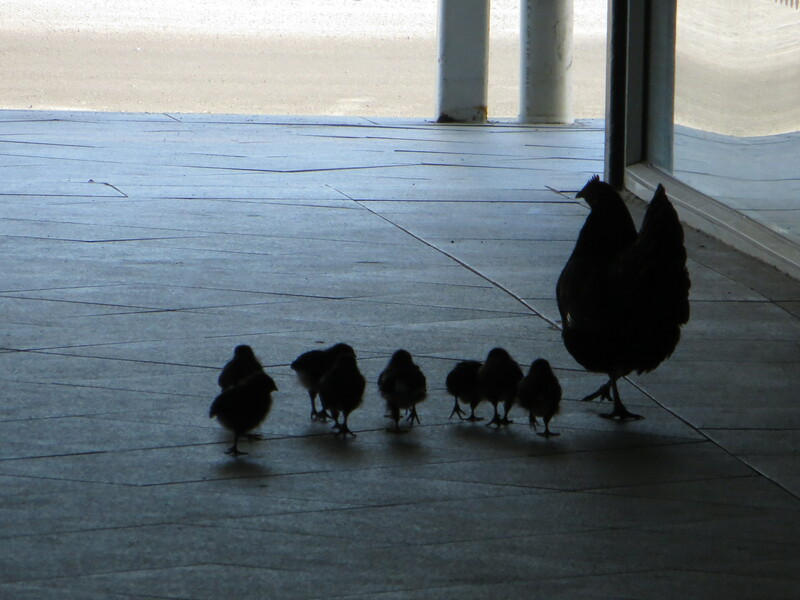 Please note the hen and chickens, photographed in silhouette in the Rarotonga airport. I found them an attractive new breed of airport security. But even more I loved the Air New Zealand flight safety video, which whole-heartedly introduces the Kiwi experience. If you haven’t travelled Air New Zealand recenty, you MUST play this YouTube video. For the first time in my years of travel, I listened closely to a flight video. I have certainly never experienced a plane-full of several hundred people unable to take their eyes from their screens, laughing broadly all the while. The video has a certain irreverence that alerts you to the New Zealand spirit before you have to deal with it in person. Kiwis seem to have missed out on the serum of Sober Correctness that has immunised pretty much every other airline I’ve flown on. Perhaps the most expensive safety video ever produced, it steals heartily from the movie Men in Black, while paying mischievous tribute to the mighty All Blacks. It’s an altogether superior way to contemplate a crash landing. Besides, after all these years I could now probably find a life vest on the plane if I needed one. At any rate, we landed without so much as a runway thump in Auckland, where we rented a van and drove a few hours south to Rotorua. The red line gives you a highly approximate idea of the small part of the North Island we explored. On our first evening, in Rotorua (itself a charming town no doubt full of surprises we didn’t get to explore), we went to the Tamaki Maori Village. As cultural introductions go, this one was warm and engaging, with an authentic feel. We experienced elements of the marae (a traditional religious political ceremony) and were treated to excellent demonstrations of some half dozen other long-time Maori practices. You’ll have heard of the haka, but have you seen it enacted live? This amazingly aggressive war dance is no doubt what keeps the All Blacks at the top of the rugby scrum. Our tour guide tells us that the dance was developed to terrify and deter the enemy, but that in practice it probably had the effect of enraging and inciting them into battle. (There’s a message in that for all of us.) Check out the haka’s modern day application here. Stand well back from your monitor. The acting and dancing was superb, the food (much of it cooked in the “hangi” pit) was excellent, and the hundred fifty or so of us on the tour were happily sated at the end. But there’s no accounting for what sticks in your memory. A part of the evening I remember very fondly was driving back to our rendezvous in a large coach, where our Maori driver, in a deep, smooth baritone, led us in round-the-world-old-familiar songs the whole way. And in a demonstration of Kiwi-style anarchy, he drove his big bus and 40 startled passengers around a small round-about several times to the tune of “The wheels on the bus go round and round”… … … Perhaps you had to be there. Our second day gave us a glimpse of one of the area’s three active volcanoes, a reminder for me that we live on a rather thin crust of earth—and that active volcanoes have a habit of surprising people. Our first stop was to visit the 10:15 am display of Lady Knox, New Zealand’s very own tame geyser. No spoilers, but those sceptics among you who are wondering how a geyser can go off at 10:15 am every single day of the year will get your answer—a reasonably satisfying one. Then we walked through the most dramatic visual experience of the trip—the Wai-O-Tapu park. The crust must be uncomfortably shallow here because the extraordinary pools (all brightly coloured by different minerals, and all untamed) were at 100C, as were the bubbling mud pools, as was the magnificent Champagne Pool. The whole area was exquisite and unsettling at the same time. The three dramatic peaks of the area are Ruapehu, Tongariro, and Ngarahoe. I tell you this because I loved the mountains, and I loved their names. I spent all day alternately photographing them and trying to get my tongue around the unfamiliar words. Almost every name in the countryside we travelled was Maori, and it was a wonder how much difficulty I had learning and remembering them. I’m still working on Aotearoa, which is the increasingly-popular Maori name for New Zealand. (My ear hears it as “Ow-tea-a-roa”.) I’ve never been big on changing place-names, but there’s something about the Kiwis and their naming conventions that has me wondering. We spent a day travelling the Forgotten Highway. It apparently stays forgotten—through the whole of its steep, winding way, with sheep-strewn hillsides and a small fortune in fencing, we saw almost no vehicles. Statuesque Lombardi poplar windbreaks are everywhere. They were planted by Europeans to mark boundaries and river fords, and by disciples of the Maori prophet Te Kooti, to symbolise a new pathway away from war and towards peace. Everywhere the two cultures seem to merge rather than wrangle. Lunch at the pub in the Independent Republic of Whangamomona is not to be missed, representing as it does another example of Kiwi humour cheerfully overcoming political correctness and deference. Be sure to read about its long line of Presidents. Our final day was spent cruising through the scenic villages on the west coast; I wish we’d had a week for this. Rick and I have often been known to say quietly to each other, “We could live here.” The towns and countryside of New Zealand were no exception. Dear, dear MIssy Heather…I am home again after 3 weeks with JOy in Dallas. so am just catching up with your wonderful, educating e mails. Love, love to you and Rick…..
Click here to get it at Amazon for only $3.04!